Terri Lu and JohnWu are among the new generation of Chinese American entrepreneurs who have, despite being able to locate elsewhere in the City, decided to plant themselves firmly in Chinatown with their new bakery Everything Frosted. "I grew up here, my mom works around the corner, I went to school here, I feel very comfortable here. "says Terri. John has a similar relationship to the area "When I first came to Chinatown I lived on Bayard St. , then I moved around, but always in this area. Most of my life has been spent here in Chinatown." "Being close to home was actually important to us because of the amount of hours we knew we'd be investing" said Terri. Chinatown, only minutes from where they live, was the best of both worlds in terms of being close to their community, and finding inspiration from native ingredients. Both partners knew early on in their careers that they would be bringing their talents back to the neighborhood they loved as kids. Terri's background as a professional event planner for a midtown business laid some of the groundwork for Everything Frosted. "At my last job we had a primarily Jewish clientèle, we did a lot of Bar Mitzvahs and weddings, and some corporate events as well. After my career with that company I was inspired to do events for the Asian community because there are so many more traditions that I wanted to explore. Even though I know a lot about my own culture, I found that there was more to learn about what the Chinese community wants in an event." said Terri. 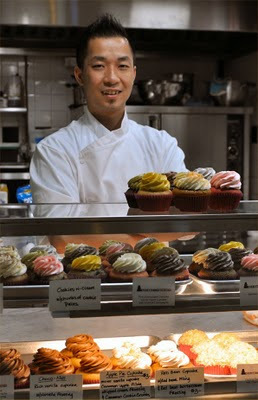 John's career began in a Chinese bakery. It was there that he thought to explore the larger repertoire of baking, after exposure to the various flavors native to the Chinese culture. He wanted to eventually bring his knowledge and experience back to the Chinese community to see what they would think about combining his newfound techniques with traditional and familiar ingredients such as red bean, green tea, and jasmine. Over a decade later, and apprenticeships with two French masters, he has achieved his goal. Looking back John recalls one of his teachers who spoke only French. "It was very challenging, but I picked up enough French from him, at least what he needed to teach me. I learned a lot from him. He tried so hard to teach me, that I put my entire heart into it. Within a short time he left that restaurant and called me to join him at a new place. 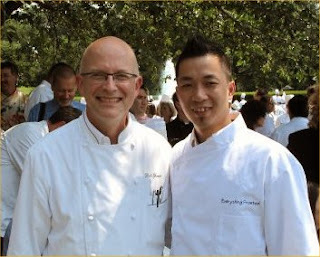 That is how I met Bill, (the Whitehouse Executive Pastry Chef Bill Yosses.) The two chefs were friends, and I started working for Bill at Joseph. (Joseph Gurrera, owner of Citarella)" said John. Yosses who joined the Whitehouse in 2006 worked shoulder to shoulder with John prior to landing his prestigious position at the Whitehouse. John continued "I like Asian desserts and I love tea. What I learned from Bill is that I have to create my own flavors. "I like to use Asian ingredients and come out with things people have never tried." 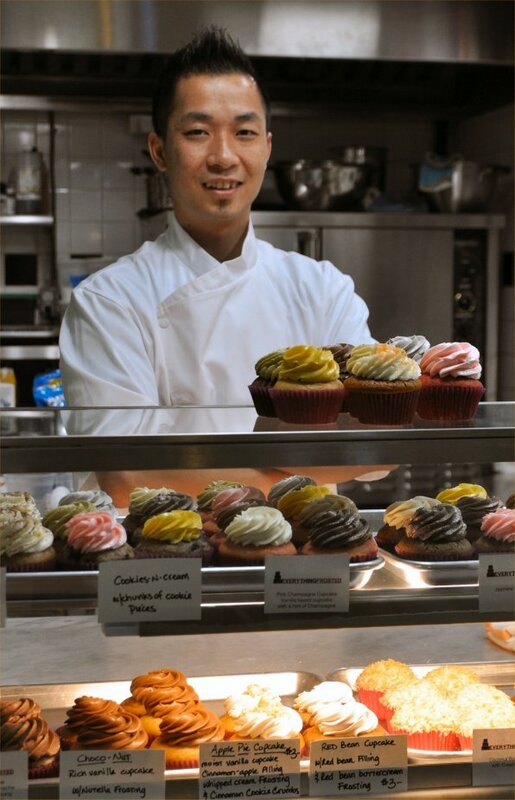 "You don't see a lot of bakeries with black sesame frosting. Over the summer we had a lychee frosting that was very popular." John introduced jasmin, lychee, black sesame and red bean to many of his non-Asian customers who are often on a lunch break. 90% of the flavor combinations of cupcakes, which are appetizingly displayed at eye level, can be adapted to wedding or birthday cakes, jasmin cake with green tea frosting for example. In the nine months since they have opened Terri and John's "hidden gem" of a business has reached beyond their professional Asian clientèle. With recent press and very active word of mouth advertising they are enjoying a comfortable level of success in their first year in Chinatown. This is a great article about how it's good to return to Chinatown. Too bad most white-washed Americanized Chinese don't see that.